If you like white beaches and crystal clear water but don't want to fork out a fortune to a far off tropical land then Formentera is the place for you. I'm not going to lie, the idea of going to Formentera came from a recommendation from my Granny. If Madge likes somewhere then it must be good as everything is generally no more than 'fine' when it comes to anything she does (except spending time with me, obviously). Formentera is a small island located half an hour by boat from Ibiza Old Town. Tickets aren't expensive either and boats run every half an hour to and from the island. We took the boat from San Antonio Bay. It took an hour and a half which wouldn't have been bad except it was so windy it could have easily rivalled Scotland (obviously used my beach towel as a wind shield). 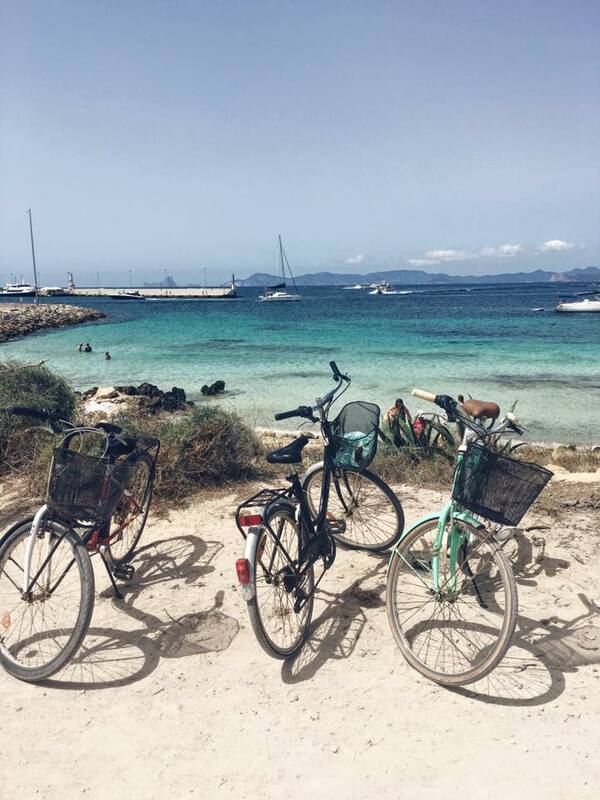 When we arrived we quickly realised that the thing to do in Fomentera is hire a bike and cycle to a beach. Even though I don't think I had been on a bike since I was roughy 11 we decided €10 for the day was too good an offer not to accept. I'm not going to lie though, the bikes were 100% older than me, my brakes didn't work and the suspension definitely had been non-existent for years. Even still, hiring a bike was worth it as the nearest beach was quite far away. The beaches were amazing. The only downside was the fact that the main beach was so busy that there was hardly any space to stand, never mind get your beach towel down. This meant that sadly we had to go the beach cafe and find a Mojito... I'd suggest that if anyone was planning a trip to Fomentera then go to one of the beaches closer to the harbour. The sea is just as crystal clear and there are a lottttt less people. On the way back to the harbour we stopped at the cutest ice cream shop in the main square for some of the tastiest ice cream I've ever had (Not number 1, I have been to Italy and nowhere beats Italian Gelato! ))and then had a look about the market. They sell a lot of quirky jewellery which made good gifts to take home for friends and family. Unfortunately, the boat did come to pick us up so we couldn't stay forever. A trip back to Fomentera will definitely be on the cards for me and I'd definitely suggest visiting the Island if you are staying in Ibiza. It's 100% worth the trip! That sea is SO clear. Looks lovely. I've never been to Ibiza, but yep, thanks for adding another place to my travel wishlist! Formentera is definitely dreamy!! I wouldn't hesitate to go back! Thank you so much! 100% you need to! It is! It's v dreamy!!! It's so, so blue! I'd never been anywhere like it before! I love it over there!